It’s been a good while since I’ve posted a fishing report. Things have been so crazy I just keep forgetting but I wanted to provide a quick update of some recent trips and results to let everyone know what is going on and how the catfishing is, some updates on the local lakes and more North Texas Catfish Guide Service news! 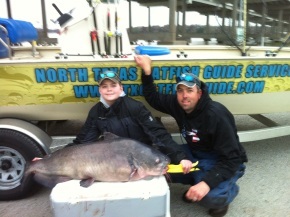 Several months ago I posted that Robert Horton had joined North Texas Catfish Guide Service and we were now running a 20′ Air Ranger air boat on the Red River and Brazos River fishing for Trophy Blue Catfish. Terry Terry (Brother Terry) has joined the North Texas Catfish Guide Service team as well to add another boat to our fleet at Eagle Mountain Lake. Terry has been guiding on the local lakes for several years and had taken a break from guiding to focus on some other priorities. When he decided to start guiding again I was happy to bring him on the team. 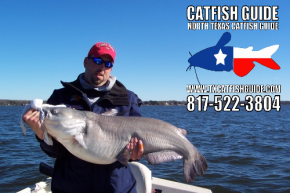 I’ve been working side by side with Terry on Eagle Mountain Lake for a number of years now and speaking on a regular basis and I knew he would be a great fit for the North Texas Catfish Guide Service clients. Terry knows the lakes and knows catfish and will continue the standard of excellence that’s been set for our Eagle Mountain Lake fishing guide service. I’ve had a number of people contact me asking if I had stopped guiding or if i was going to stop guiding. The answer is no, I have not stopped guiding and have no plans to stop. Here’s the deal. 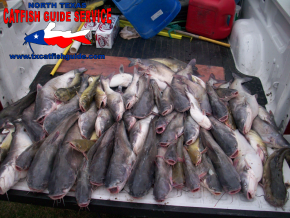 I’ve been at the helm of North Texas Catfish Guide Service for nearly 15 years now and during that time I’ve always done things the same way and I’ve always had another guide to help. That “help” I had from an additional guide became unavailable due to health issues so I’ve been left running solo for the last couple of years. I’ve also been juggling a lot of other priorities as my other fishing related ventures with Learn To Catch Catfish, Catfish Edge, hosting the Southwest Outdoors Report and now of recent writing and photography for numerous magazines I’ve become stretched pretty thin. I’m focusing some energy on getting some other aspects of the business in order and have my hand in a lot of new things that will be announced later this year. I’m still fishing, just not fishing so much that I kill myself and taking some time to address some of my new business ventures. I’ll still be on the water guiding clients and although my scheduling has been a nightmare over the past few months there’s a light at the end of the tunnel and it should start getting easier soon. 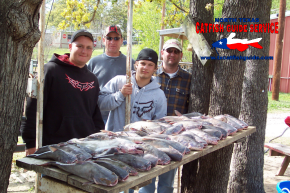 Regardless of whether you’re booked with me or another of the North Texas Catfish Guide Service guides you’ll be fishing with someone that I know has the skills and abilities to put you on fish! Just make sure that if you want to fish with me, you let us know and we’ll do everything we can to make sure you get taken care of. If you’ve fished with me before just give me a call instead of completing the booking form. I’ve been getting a bunch of phone calls and emails of recent wanting to know about the water levels at Eagle Mountain Lake. The lake is very low, probably as low or lower than I have seen it in decades. If you don’t know the lake very well you need to make sure you have a good map or GPS and pay very close attention to the shallow water areas. There are a few boat ramps open still including the Fort Worth Anglers Club, Lakeview Marina and the new Twin Points Park boat ramp. To my knowledge all of the other boat ramps are closed at this time. 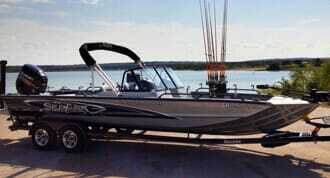 Will you still be able to launch a boat at Eagle Mountain Lake? Everyone seems to be wondering what’s going to happen this summer. I’ll tell you the same thing that I’ve been telling everyone else for the past few months. If we don’t get some major rain in the next two months (before mid May) then my guess is now, you will not be able to launch a boat except for at the new Twin Points Ramp and even that may be questionable. I’ve been told it will be good to a -15 foot level but have not confirmed that. My expectation is that if we do not get some serious rain (enough to bring the lake up about six feet) then there will be nowhere to launch a boat on the lake unless the TRWD starts pumping water in fast an furious pretty soon and keeps doing so for months. In the summer the lake drops quickly and going into June with the lake as low as it is now will not be good. Now, this is based on nobody extending boat ramps or doing something to help compensate for the low water levels. Water temperatures reached levels I’ve not seen in many years but the fishing has been red hot! We’ve caught excellent numbers of Trophy Blue Catfish all winter and continue to do so and we are heading into spring which is the best blue catfish action of the year. Long story short, if you want fast paced action and lot’s of catfish you need to get your trip booked soon for the spring blue catfish bite! You can also view photos from the February 2014 Fishing Report here.